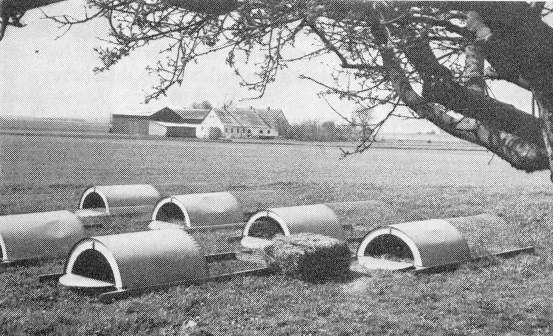 There are many variants of grazing hutches. The one shown here, was designed by Erling Balle for the Danish association of Rabbit-breeders. The hutch has a grazing area of 1.2 m² and can hold a litter of 6-8 until they are ready for slaughter. 2 Frame is placed on two laths, so you can reach it from all sides. Top thread is fastened with ¾ staples on the inner side of the frame, about 2 cm from the top. The laths are knocked a little apart, so the thread can go between the length- and cross laths. The thread is joined on the middle with thread clips. 5 The sheet of masonite is pushed into place, sliding on the nails that join the frame. Lift in place with a wood chisel and tap the laths together. 6 The 1" x 6" threshold is formed with rounded corners and fastened with nails through the masonite. Strengthen the edge with a metal band keep the rabbits from gnawing on it. 7 The bottom netting of the open part, is fastened to the bottom of the laths, and the bottom thread of the 'cabin', is fastened on top of the laths. 8 The gable of chip board is not hinged, but is kept in place by two blocks on the outside of the lath and one on the inside. Place a grip on the upper part and lock it with a big nail through a hole in the masonite. On a grassy field with cloves you should calculate with 8-10 m² grazing area per animal. By normal grass growth, two moves per day should be sufficient. Supplement with 50 g feed per animal a day.